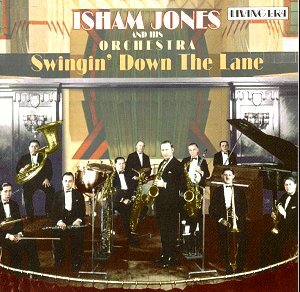 Isham Jones was Ohio born in 1894 and was a jobbing multi-instrumentalist (piano, fiddle, saxophone) when he moved to Chicago in 1915. More importantly he showed an interest in writing arrangements and this held him in good stead when record companies signed his band, which they were quick to do. The earliest recording in Living Era’s conspectus dates from 1921, though they actually start with a 1947 track so that, the suspicious critic thinks, the ear can work backwards from pretty good fidelity to an acoustic series. Some big names sang with the band – Jolson and Crosby among them – and later on instrumentalists who passed through the ranks were to include Jack Jenney and Woody Herman. Jones retired in the height of the Swing Era – 1936 – and though there were a few attempts at re-forming the band and revisiting old musical successes, such as the 1947 sessions here, the hey day of the band had long since gone, as indeed had to all intents and purposes the days of the big band itself. Jones died in 1956. Actually the compilers really should have started with the 1921 tracks and had the courage of chronological convictions. They were very well recorded by Brunswick, certainly well enough to hear Charles McNeil’s work on banjo with real clarity. The band then was a rather stiff, rinky-dink eleven-piece dance orchestra. It used ODJB trumpet neighs and sobs, a two-violin section (playing a unison solo in The World is waiting for the Sunrise) and sporting a competent non-jazz trumpet lead and a wobbly old trombone soloist. Colour was provided by the ukulele virtuosity of Bud DeSylva on Jolson’s immortal California Here I Come. Most of the other vocalists are "period" but there are real pleasures to be had listening to stray solos – sample pianist Roy Bargy’s busy work throughout for example even when the band is at its clunkiest. They had a big hit with Hoagy Carmichael’s Stardust, played at a very slow tempo and listen out for Sweet Georgia Brown where in addition to Crosby’s vocal Eddie Lang is on guitar and Herman on saxophone. As an indication of the band’s priorities they were still using a tuba here, in 1932, when almost everyone else had discarded it in favour of the double bass. Later on a more relaxed feeling creeps in, especially with Gordon Jenkins’ arrangements and the post 1932 tracks show the band at its most delightful and relaxed. After the War the band revisited its past glories but it sounds a really old fashioned, almost mood music aggregation of session men – no personnel are listed – and vocalist Curt Massey tends to hog proceedings. Top marks to Living Era for their documentary information; personnel, dates of recording and dates of the original composition of a song are here as well as matrix and issue numbers. I’ve been impressed by their comprehensive work in this series before and I’m still impressed.